For someone who is a trained hairstylist I've noticed that I very rarely actually feature hair products so I'm going to hopefully start featuring some products that I really like and have felt worked miracles on my hair. A few years ago I got my hair bleached, naturally my hair is very dark brown almost black so when I go to bleach it it takes quite some time. When I finally went back to my natural hair colour my hair all snapped and I was left with just above the shoulder length hair whereas it was down my back! Since then I vowed to never bleach my hair again until Summer just gone when I decided to go a lighter brown and add some balayage. So yes the condition is gone back to well pretty bad but not as bad as last time however I'm taking care of it so that hopefully never happens again! I've been using these two MADES haircare items these past few weeks and I'm quite surprised at how good the results are. My hair because it has been bleached is obviously quite damaged and fragile. When it's wet it feels like cotton wool and that's the last thing you want your hair feeling of it's really not good. However these two products have definitely helped the overall look and condition of my hair. 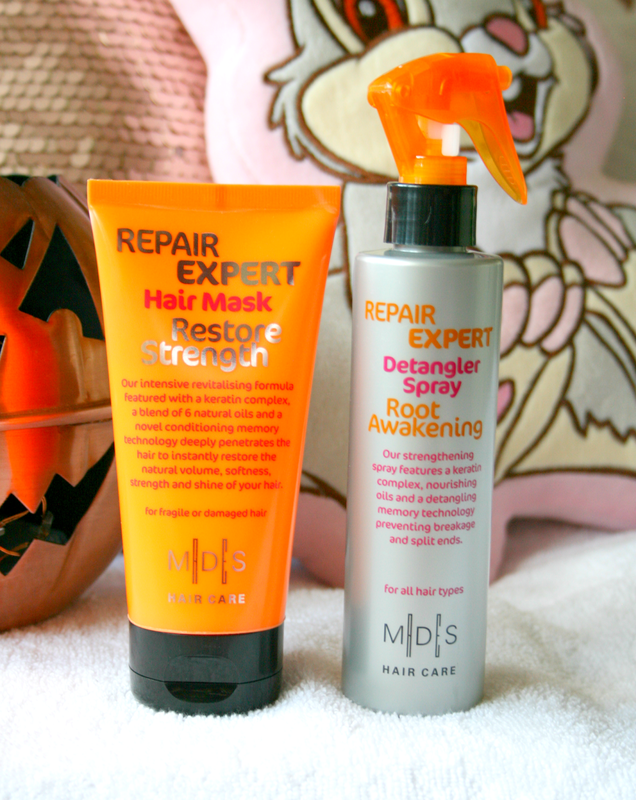 Starting with the Repair Expert Restore Strength Hair Mask* which you apply once a week which I really liked because if I have to use a mask more than once a week it's likely I'm not going to stick with it because sometimes I'm just lazy or don't have the time to leave it in. This hair mask (actually both products) are especially for damaged and fragile hair) consisting of a blend of 6 natural oils including jojoba and avocado oil it penetrates into the hair to help restore the natural volume, softness and strength. I will say I noticed a difference after only one use of this mask. After using this and then styling my hair, you could notice a nice healthy shine off it and it even felt much softer and had barely any knots in it. It also amazingly reduces split ends, now it won't make them disappear as the only thing that will make them disappear is cutting them off but this definitely does help prevent you getting more! You simply apply this after washing your hair so that it's still damp and leave it on for five minutes and once you wash it off you'll feel and even notice a difference. I've been using this for well over a month now and I still have some product left as it spreads really well and you don't have to use a load of product at once! The other product I tried out was the Root Awakening Detangler Spray* and I knew I was going to love this before I even used it because I am all for detangling sprays especially because of how dry and damaged my hair is it needs all the help it can get! (This just reminded me I have to buy myself a Tangle Teezer) This can be used for all hair types and it basically just helps your brush detangle knots a lot easier than it would be without some! However what I like about this particular one is that you can actually use it on second day hair as it has mild cleansing meaning you can spray this into your second day hair give it a toss around and then style it and it won't look greasy! It actually works but obviously because it's wet you have to blowdry your hair again. The spray also helps keep your scalp healthy, this time of year I usually feel like my scalp gets tight and this seems to relieve it which is great. Both products smell amazing thanks to the 6 natural essential oils inside! They both work amazingly and I can see myself purchasing more when I run out. MADES Haircare also have different products in the range so there's something for every hair type, such as blonde hair, anti-frizz, wonder volume and more! For just €8.99 a product they are definitely worth every penny.You can find MADES Haircare products in McCabes, Meaghers and Health Express Pharmacys (pstt they are all offering 33% off the range right now) so definitely keep an eye out for them as they truly are amazing!